Meet authors Janet Borgerson & Jonathan Schroeder and get a signed copy of Designed for Hi-Fi Living, the holiday perfect gift for music-lovers who'd rather have the LP. "The sleek hi-fi console in a well-appointed midcentury American living room might have had a stack of albums by musicians like Frank Sinatra, Elvis Presley, or Patti Page. It was just as likely to have had a selection of LPs from slightly different genres, with such titles as Cocktail Time, Music for a Chinese Dinner at Home, The Perfect Background Music for Your Home Movies, Honeymoon in Hawaii, Strings for a Space Age, or Cairo The Music of Modern Egypt. The brilliantly hued, full-color cover art might show an ideal listener, an ideal living room, an ideal tourist in an exotic landscape -- or even an ideal space traveler. 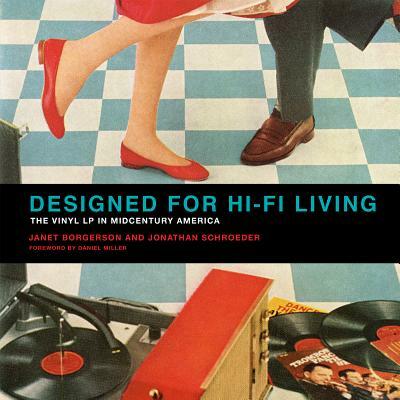 In Designed for Hi-Fi Living, Janet Borgerson and Jonathan Schroeder listen to and look at these vinyl LPs, scouring the cover art and the liner notes, and find that these albums offered a guide for aspirational Americans who yearned to be modern in postwar consumer culture." Can't join us for the event itself? Preorder your copy and we'll get it signed for you! Just let us know how you'd like your book inscribed.